Ferny Creek wildlife campaigner Donalea Patman OAM struck another blow against the Australian ivory and rhino horn trade during World Wildlife Day on Saturday 3 March. At an inaugural awareness event staged at the Bourke Street Mall, dubbed the World Wildlife Day Melbourne Crush, Ms Patman’s group For the Love of Wildlife joined forces with Australian designer Collette Dinnigan. In front of thousands of guests and onlookers, Dinnigan, Ms Patman and La Trobe MP Jason Wood were present to spread the message that Australia must join the fight to save the elephant and rhinoceros from extinction through stopping the sale of rhino horn and ivory. One of Australia’s preeminent designers in Dinnigan, present at one of the city’s fashion capitals, was intended to send a message that such items are not an acceptable fashion accessory. This was further impressed as rhino horn and ivory items were destroyed. Many of these items had been donated, with Melbourne Zoo also receiving items from the public. Ms Patman said elephants and rhinos are being killed to feed global demand, of which Australia is part of the problem. “One elephant is killed every 15 minutes for its tusks and a rhino every eight hours for its horn. There are less than 30,000 rhinos remaining in the world today,” Ms Patman said. “The sale of the elephant ivory and rhino horn items within Australia and New Zealand is allowed, and there are not checks and balances in place to prevent items made from recently killed animals being sold in our own backyard. 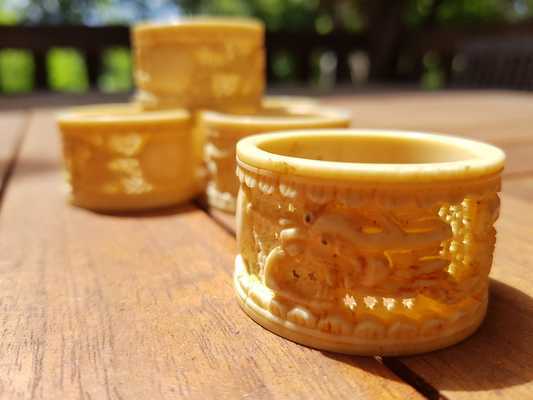 Although hundreds of illegal ivory and rhinoceros horn items were seized at the Australian and New Zealand borders between 2010 and 2016, there are no regulations in place to prevent illegally imported items entering the internal market. 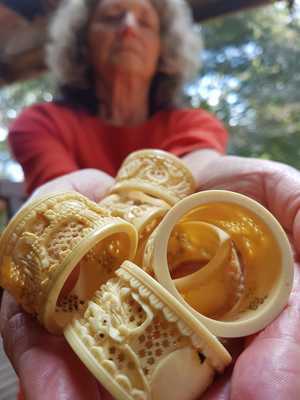 “Ivory tusks carvings, statues, jewellery are all sold without any proof of their age, source or origin,” Ms Patman said. “I’ve seen hundreds of items for sale in online auctions, antique and bric-a-brac stores, rarely without any documentation. Federal MP, Jason Wood, tabled a Motion in the House of Representatives late last year calling for a ban on the ivory and rhino horn trade, saying “when you see what these poachers are doing, it’s disgusting and exceptionally cruel”. The event has drawn support from iconic conservationist Dr Jane Goodall, celebrated Australian actress Asher Keddie and music legend John Farnham. 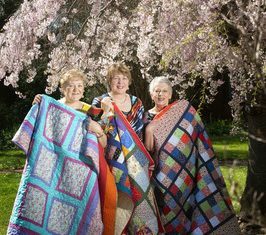 Ethical philosopher Peter Singer AO and New Zealand’s ex-Prime Minister Helen Clark have also posted messages of support for stopping the sale of these items. Also present at the awareness event was one of Ms Patman’s most staunch supporters, Karen Pomeranz, a Sherbrooke resident of more than 40 years. “It (was) about giving people the opportunity to think about this issue; people who may have not thought much about it before,” she said. “To think we are allowing this to happen in Australia, after these incredible animals have been on this Earth for centuries, is just wrong. The weekend event is far from the first blow Ms Patman has struck against the industry. In 2015, her efforts resulted in the Australian Government implementing a ban on the importation of lion trophies and body parts – the first country to do so. Ms Patman was pleased to get support from Mr Wood, and then thrilled when in March 2015 the Minister for Environment, Greg Hunt, announced the ban.